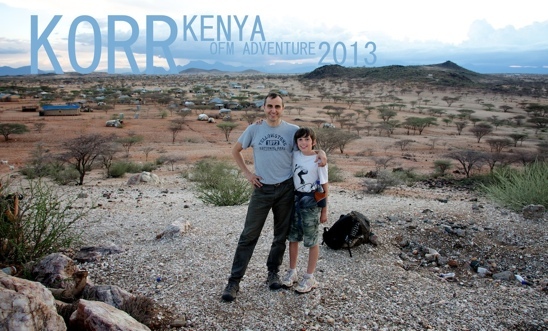 Korr sits in the heart of the NFD – Kenya’s “Northern Frontier District.” It certainly feels like a frontier. A flat expanse of semi-desert set between a slug of ancient lava flow and a range of other-worldly mountains, it possesses a raw and dangerous kind of beauty. And though you might think it impossible, Korr is habitable. In fact its home to a resilient and beautiful people known as the Rendille. I’ve been in and out of Korr countless times over the years, but always with an airplane. I’ve been told I need to make the trip by Land Rover to truly appreciate the journey. But just being on the ground up there is adventure enough for me, and I think I can do without the harrowing drive and river crossings. Last week we returned to Korr. The media team spent five days shooting a video for AIM’s education ministries. And since there was room on the airplane, Zach joined us for his first real “on field” media experience. He did well with the rugged conditions. Less well with the insects. Even less well with the in-flight turbulence. But I was impressed with his own resilience and open heart. It was a beautiful week, complete with a few days of dousing rain—a very rare thing in Korr—and a few nights of clear skies with an unfettered view of the galaxy. In the course of our time there, we traveled to one of the outlying villages for a visit with a Christian Rendille women from the local church. Her name was Nareyo. Our team of five squeezed into her hut and sat down—women on one side and men on the other—atop a camel skin. David, our Rendille host and a good family friend, translated for us as she shared her story. She told us her tale of redemption, which began with the adult literacy program that missionaries had established in Korr. As her reading skills steadily improved, she received a small book: A portion of the New Testament newly translated into Rendille. She called it a “precious thing.” The words of that book, she told us, eventually pierced her heart, crushed the fears that held her captive, and introduced her to Jesus. David interrupted the story here and asked me if I had been there for the dedication of the translation when it arrived. I couldn’t recall, but I did remember being one of the pilots who flew in the boxes of newly printed books. David relayed this to Nareyo and she lit up. She reached across the hut and grabbed my hand and began pulling me toward her. Sitting on the ground, and not as flexible as I once used to be, I was stuck where I sat. But she just kept pulling on my hand, trying to bring me closer, speaking, smiling. Her face was joy and gratitude and astonishment. And as she grasped my hand she blew kisses at me. Over and over. I smiled, a little embarrassed, but also somewhat honored, as she poured out this undeserved shower of praise. David translated for me. It was a small part. I was just the messenger, delivering in a day what took decades for others to accomplish. But Nareyo loved me for it nonetheless. I was taken back by this encounter, and reminded of my own long service as a pilot here in Africa. For 13 years I was the messenger. I certainly can’t remember all the people and places and boxes in the cargo pod. But I wonder now how many of those trips played a small part in someone’s redemption story. The Bible says that those who bring good news are “beautiful.” I guess I have seen this many times in the course of our missionary work. But I think this was the first time I was kissed for it. So touching and true! How humbling to be a small yet so significant part in God’s amazing redemption story that keeps going and going!! What a life. Thank you for posting, thank you for using your gifts and sharing, Mike! Happy for you and Zach that he could be with you in Korr. Much love to you and your family.